A while back you may recall we reported on The Ancient World, a marvellous afternoon and evening of screenings of early films set in Ancient Greece and Rome, organised by the Department of Greek and Latin at University College London, as part its The Ancient World in Silent Cinema research project. They promised a second show, and it’s just been announced. The Ancient World in Silent Cinema 2 will present an afternoon and evening of silent film screenings with piano accompaniment and related talks, this time featuring films with settings in Biblical or Near Eastern Antiquity. The event is open to the public and admission is free. It takes place Monday 22 June at UCL Bloomsbury Theatre, 15 Gordon Street, London. * Sacra Bibbia / The Sacred Bible (IT 1920), episode of ‘The Story of Joseph in Egypt’ 9 mins. 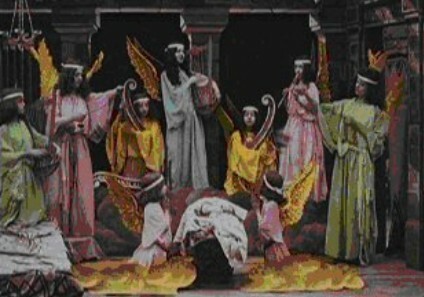 Films of the ancient world, and particularly films on biblical themes, were of huge importance to the early cinema, capturing audiences with familiar stories and iconography, frequently augmented by the use of colour (stencil colour was regularly used for costume dramas and subjects with classical themes). Such films helped establish the early cinema’s pretensions, and its morality. Among the several gems in the programme, I recommend in particular Aveugle de Jérusalem, a Gaumont drama directed by Louis Feuillade which features a non-Biblical miracle story – a blind man has his sight restored by Christ, only to discover that his daughter has a lover and that his servants have been robbing him. He angrily throws them out of his house, only to learn forgiveness when he sees Christ on his way to Calvary. It is the model early film, in form and imagination. The Ancient World in Silent Cinema project is doing admirable work in looking at early films from contexts other than film history, introducing them to a scholarly audience familiar with the histories and cultural contexts of the ancient world in general. In truth, those other contexts have always been a part of film history, because films can only be a reflection of the cultures that produce them. We just need them to be seen not only by those who value their film history, but by everyone who may learn from them. The first Ancient World screening day was an inspiring and genuinely illuminating event, bolstered by an enthusiastic audience, a fine venue and some superb music. Programme two is going to be well worth attending. Anyone interested in the research project or the screenings should contact Maria Wyke (m.wyke [at] ucl.ac.uk).